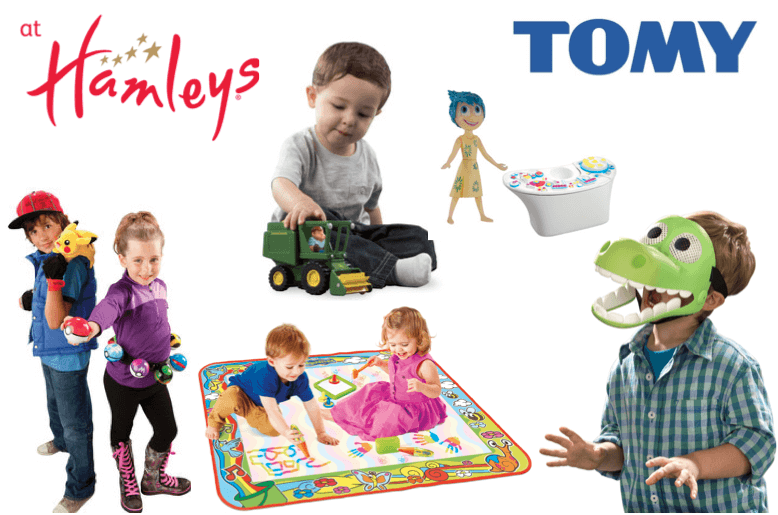 TOMY Toys have teamed up with Hamleys to offer 10 lucky readers the chance to attend a one of kind Play Day experience during half term. The event takes place at the Hamleys Regent Street Store, on Wednesday 28th October with surprise celebrity guests. The ultimate play day from TOMY will have something for everyone! Children will get the chance to preview The Good Dinosaur creative play range from TOMY in anticipation of Disney Pixar’s upcoming release. There will be farmyard fun from Britains farm toys from TOMY; the latest releases from Britains will be available on the day for all the budding young farmers to enjoy. Pokémon fans will have the chance to reveal their inner Trainer and drive to train, battle and catch ‘em all with the new generation of Pokémon X and Pokémon Y TOMY toys. Kids will also be invited to get creative with Aquadoodle’s range of preschool character licensed play mats, allowing kids to get colourful and creative without the mess. Little ones will also be able to delve inside Riley’s mind as they share their memories from Disney Pixar’s Inside Out with TOMY’s creative play range featuring Joy, Sadness, Anger, Disgust, Fear and Bing Bong. We have 10 places to giveaway for one adult and two lucky children to attend a play session at this amazing one of a kind event from TOMY at the finest toyshop in the world! Each play session will last for 1.5 hours after which every child will be free to explore all seven magical floors of Hamleys. Hamleys resident characters including Hattie or Hamley Bear will be on-hand for fun & games on the shop floor. There will be delicious food and drinks available and each child will receive an amazing TOMY goody bag to take home. Hamleys Marketing & Events Manager Francesca Francois said; ‘Events with TOMY are always so popular in Hamleys and we are delighted to have the brand hold their Play Day event in our great store and introduce creative play with all their exciting and new products’. For your chance to win this money can’t buy experience from TOMY, simply fill in the rafflecopter below – you can enter using any of the entry options! This giveaway ends Friday night (23/10/15) at midnight so you have to be quick!